In December 2009, Andrew Gilligan, the Mayor of London’s cycling tsar wrote an article for a local Greenwich website, vehemently criticising Greenwich Council’s plans to reconfigure Greenwich Town Centre. 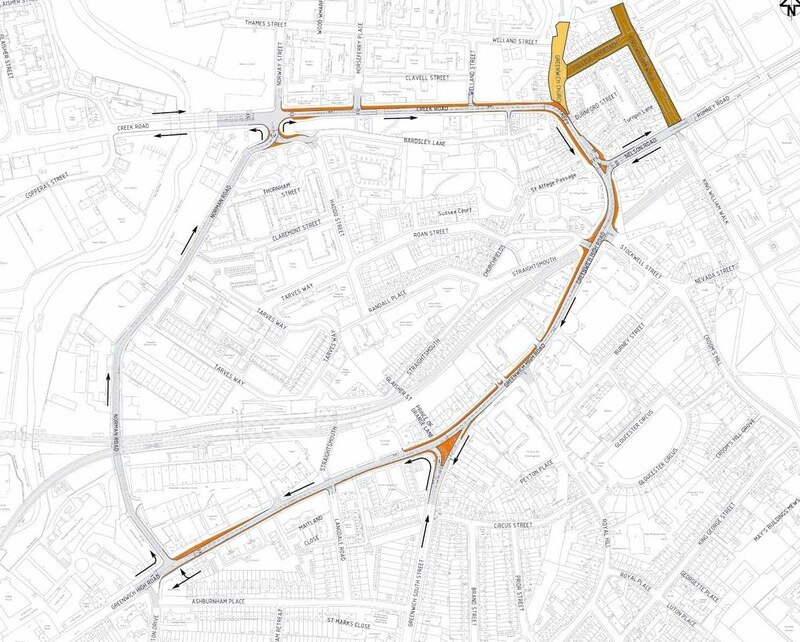 “the suggested changes will only remove traffic from a relatively small part of the centre. Isn’t this exactly what Mr Gilligan is proposing to do in Enfield? “Most options proposed will also devastate Greenwich's bus service, hardly conducive to a car­free future. The only one which doesn't do this will, as the council admits, lead to extra congestion”. So Mr Gilligan how come this isn’t acceptable for bus passengers and residents in Greenwich but acceptable for the residents of Enfield? Under the Cycle Enfield proposals, bus passengers in our borough will be adversely affected in many ways. Bus stops are to be removed, with passengers forced to board or alight from a bus across a bike lane. There will be delays to bus passengers and other road users because of the removal of bus lanes entering Palmers Green and Enfield Town. As the A105 (Green Lanes) is narrow, buses will have to stop on the carriageway whilst passengers get on or off, resulting in a build up of traffic behind buses. Would Mr Gilligan accept this level of disruption for bus passengers in Greenwich? The "victims” – Mr Gilligan’s choice of words “will be local residents and nontourist businesses". So if Mr Gilligan can understand the problems for residents and businesses in Greenwich, why is he so blinkered to the problems that his cycle lane scheme will create for residents and businesses in our local area? This is all starting to sound awfully familiar. Mr Gilligan do you think that these accusations could also be levelled at your cycle lane proposals for Enfield? The people of Enfield have likewise been ‘sold’ cycling as a panacea for the problems of congestion and failing high streets. We have been told that the proposed cycle lane schemes will reduce congestion and pollution, without a shred of evidence to back up these assertions. Mr Gilligan clearly has an in-depth local knowledge of Greenwich and can see few advantages for the proposed road scheme. He argues strongly against pedestrianisation. Yet Mr Gilligan seems perfectly happy to “pedestrianise” Enfield Town. If you take away parked cars and through traffic from Church Street (except for buses and cycles) almost certainly there will be a worsening the problems with antisocial behaviour and lack of footfall that already exist. “traffic and pollution would be spread over a wider area. Even if the total number of vehicles does not change, most drivers coming from the east and south will have to use more roads and drive significantly further to pass through the area. This means more pollution for everyone, and more traffic for many”. If Mr Gilligan can understand perfectly the problems that these proposals would cause for Greenwich, why does he choose not to understand that these are EXACTLY the problems that will result from installing segregated cycle lanes along Green Lanes, (from Enfield Town to the North Circular), Southbury Road and around Enfield Town. Perhaps he believes that it is acceptable because it is not in his backyard. Our local area (not his) can be sacrificed for this ill conceived Mini Holland scheme. Ditto the Cycle Enfield proposals! Enfield Council, TfL and the GLA must call a halt to these similarly ill-thoughout proposals before they inflict the problems that Mr Gilligan can so clearly envisage in his own locality. Is hypocrisy Mr Gilligan's middle name?